Bristol Rovers manager Darrell Clarke has praised the attacking options available to him after his side recorded a fifth straight league win. 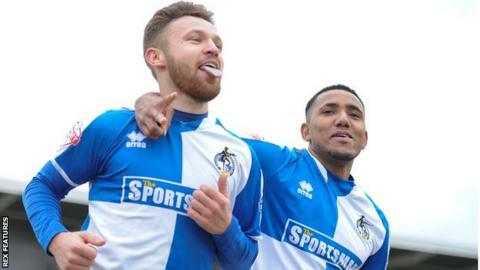 Matty Taylor scored his 21st goal of the season as Rovers beat Newport 4-1 on Saturday. in League Two. Rory Gaffney returned from injury to partner Taylor in attack, but Jermaine Easter was left out the squad. "We have real good competition in our strikeforce which is lovely jubbly," said Clarke. "I am really pleased with that. Oliver [McBurnie] has come on, Ellis [Harrison] has come on and Jermaine [Easter] has missed out, but's he's been excellent in the last three matches." Gaffney, who joined the club permanently from Cambridge in January, played almost an hour after two weeks out with a hamstring injury. Top-scorer Taylor has now scored six goals in his past five matches and has helped lift Rovers into third in League Two. Rovers boss Clarke insists his players will not lose focus, despite moving into the automatic promotion spots for the first time this season. "We will not get carried away. It's a tough Easter period and our fans will be right behind us," Clarke told BBC Radio Bristol. "We want to put the other teams under as much pressure as we can but we want to enjoy it."